We're off in just a few days to London to spend the holidays with Jason's family. I'm extremely excited, not only because London is one of my very favorite places in the world, but because we'll also be meeting our brand new nephew, born early this morning. He's a little bit early and little bit wee (though not like his big sister was), but both he and his mom are doing great. I've always heard that yarn shopping is excellent in the UK, which I'm eagerly anticipating. But I realize now that I have no specifics about London yarn stores -- any suggestions? Leave 'em in the comments! I'm still finishing up my Christmas knitting, but can't share it with you until it's been gifted since many of the recipients read here. (Or at least they used to, back when I actually updated reguarly. 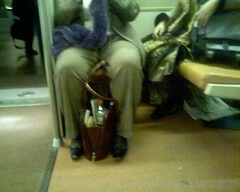 Yeah, I'm working on that.) 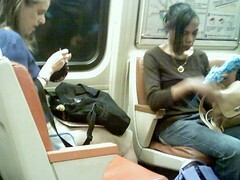 In lieu of actual content, I'll leave you with two hand-crafters seen during my commute, and caught by my trusty spy cam. Hopefully Stash Yarns will be open while you're there. http://www.stashyarns.co.uk/ I've been reading Michelle's blog since before she opened the store and she's a sweetie. Congrats on the new nephew! And just in time for your visit - what a great Christmas present. how about some rowan at liberty near picadilly circus?